VietSpeech is a research project funded by an Australian Research Council (ARC) Discovery Grant and conducted by researchers from Charles Sturt University (2018-2020). The ARC Discovery Grant is titled Vietnamese-Australian children's speech and language competence (DP180102848). VietSpeech aims to support Vietnamese-Australian children and families to maintain their home language, enhance speech skills in Vietnamese and English and equip English-speaking professionals to support multilingual children’s speech. A database of Vietnamese-Australian children’s speech acquisition and a Vietnamese-English speech program will be developed as part of the research. Expected outcomes include enhanced language maintenance and scalable prototypes for other languages. Since the Vietnamese community is one of Australia’s largest migrant groups VietSpeech should provide cultural, economic and social benefits for Australia including increased multilingualism, social cohesion, and enhanced capacity to participate in a globalized economy. Multilingualism benefits individuals and societies: culturally, economically and socially. Australia is one of the most diverse multicultural countries in the world. 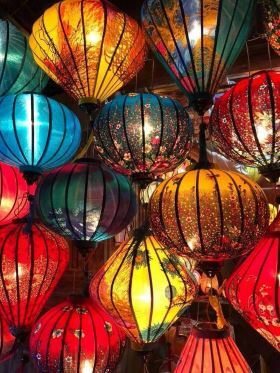 Vietnamese is one of the top 5 languages other than English in Australia (along with Mandarin, Arabic, Cantonese, Italian) and is spoken by 1.2% of the Australian population (Australian Bureau of Statistics, 2017). The Vietnamese community, with the majority entering Australian in the 1970-80s, is at a key point in time in terms of the maintenance of their home language. A shift in language dominance among migrants has been documented to occur within three generations. Currently, many of Australia’s children are becoming predominantly monolingual English users around school entry. See Multilingual Children’s Speech for existing resources to support multilingual children. The overall purpose of this Project is to (1) support Vietnamese-Australian children and families to maintain home languages, (2) enhance speech skills in Vietnamese and English (3) equip English-speaking professionals to support multilingual children’s speech acquisition. Language maintenance and home language practices will be understood through surveying the Vietnamese-Australian community and will be supported by the development of a speech program for Vietnamese-Australian children and their families. Multilingual speech acquisition will be understood by comparing pronunciation of Vietnamese and English by children and their parents. 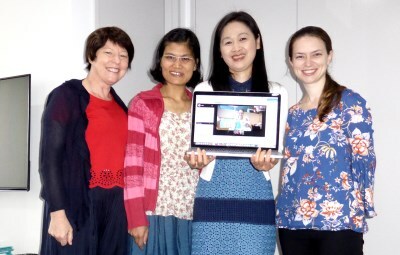 The data and resources developed through VietSpeech will enable English-speaking professionals (speech pathologists, educators) to effectively support Vietnamese-Australian children’s speech. To map Vietnamese-Australian children’s language exposure and use at home, school, and in the community. To create a database of Vietnamese-Australian children’s speech acquisition and determine markers of risk to assist in differential diagnosis between typical and disordered speech. To work with international experts to develop an evidence-based speech program (that can be implemented by English-speaking professionals and parents) to support home language maintenance and speech competence. To evaluate the effectiveness of the speech program to support Vietnamese-English home language maintenance and speech competence. Dr Van Tran, Vice Chancellor Andy Vann, Dr Sarah Verdon, Dr Ben Phạm, Dr Audrey Wang, Professor Sharynne McLeod. 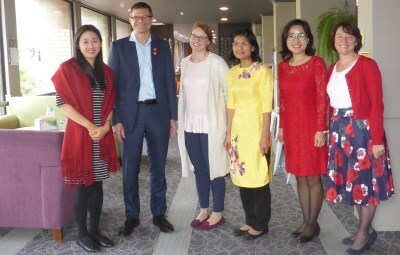 Professor Sharynne McLeod, Dr Ben Phạm, Dr Van Tran, Kate Margetson, Online (Dr Sarah Verdon, Dr Audrey Wang).